1 Make the Brownies: Adjust oven rack to lowest position and heat oven to 350 degrees F. Line a 9x13-inch baking pan with foil, leaving about a one-inch overhang on all sides. Spray with nonstick cooking spray. 2. Whisk cocoa, espresso powder, and boiling water together in large bowl until smooth. Add unsweetened chocolate and whisk until chocolate is melted. Whisk in melted butter and oil. (Mixture may look curdled.) Add eggs, yolks, and vanilla and continue to whisk until smooth and homogeneous. Whisk in sugar until fully incorporated. Add flour and salt and mix with rubber spatula until combined. 4 Make the Peanut Butter Filling: Beat together the peanut butter, butter and salt on medium speed until smooth and creamy, about 2 minutes. Reduce the speed to low and alternate adding the powdered sugar and the milk, mixing to combine after each addition. Add the vanilla extract, beat to combine, then increase the speed to medium-high and beat until completely smooth and creamy. If it seems a little bit too dry to spread, add another splash or two of milk to get it the right consistency (this could vary based on humidity levels). 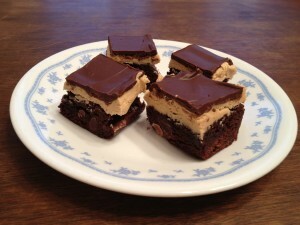 Using an offset spatula, spread the peanut butter mixture in an even layer over the top of the brownies. 5 Make the Chocolate-Peanut Butter Glaze: Melt together the chocolate chips and peanut butter in the microwave on 50% power, stirring every 30 seconds, until completely smooth and melted. Pour the mixture over the peanut butter layer and spread into an even layer with a spatula. Refrigerate for at least 30 minutes, or until set.